To read this study, click here. For information on the summit, click here. See presentations from the summit here. 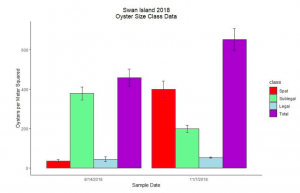 The North Carolina Department of Marine Fisheries (NCDMF) monitored the newly created Swan Island Oyster Sanctuary in August 2018, as part of their annual monitoring effort, and again in November after Hurricane Florence. Monitoring results show that overall the number of oysters in the sanctuary increased after the storm. 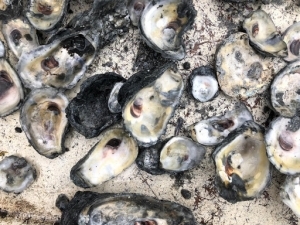 A bump in oyster spat was seen after Florence and accounts for the majority of the overall oyster population increase at this site during this timeframe. The NCDMF attributes this increase in spat to seasonal oyster spawning that occurs when the water temperature decreases. The observed decrease in sub-legal oysters is possibly due to a combination of cohort promotion and some mortality effect on this size class. The count decrease could also be a function of sample variability. The site will continue to be monitored in years to come. Note: Spat are oysters less than 25 mm in size, sub-legal oysters are 25-75 mm in size and legal oysters are greater than 75 mm. In 2017, the North Carolina General Assembly passed Section 13.13 of Session Law 2017-57, directing the North Carolina Policy Collaboratory at UNC-Chapel Hill to use a stakeholder process to prepare a Shellfish Mariculture Plan for the state by December 2018. To fulfill this mandate, the Collaboratory is partnering with the University of North Carolina – Institute of Marine Sciences and other relevant stakeholders. 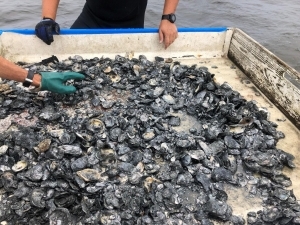 The partnership is utilized the expertise of the North Carolina Coastal Federation’s long-established and effective oyster stakeholder group that helped prepare the 2015 Oyster Restoration and Protection Plan for North Carolina. A subset of this group focused on developing the Shellfish Mariculture Plan. 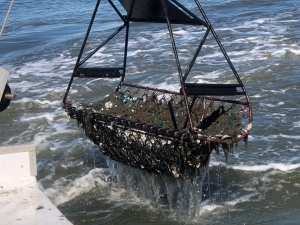 Development of this plan was a key step in implementing the mariculture goal of the Oyster Restoration and Protection Plan for North Carolina that includes seven major goals related to oyster restoration and mariculture. MOREHEAD CITY — North Carolina will officially join a national effort that demonstrates the social, economic and environmental importance of shellfish at a public event at the North Carolina State University Center for Marine Sciences and Technology (CMAST) on Aug. 2 from 10 a.m. until noon. Michael Regan, secretary of the North Carolina Department of Environmental Quality (NCDEQ), will announce Governor Cooper’s support for the North Carolina Shellfish Initiative. The statewide initiative is modeled after the National Shellfish Initiative — the National Oceanic and Atmospheric Administration’s (NOAA) program to increase the population of shellfish in the nation’s coastal waters. The North Carolina Shellfish Initiative will advance the State’s work to strengthen the coastal economy, create jobs and promote sustainable seafood and shellfish restoration. The new state initiative prioritizes four goals: job creation, protection of water quality, protection of shellfish health and sustainable management. The North Carolina Shellfish Initiative reflects the growing importance of shellfish conservation and the industry’s benefits to the coastal economy. North Carolina is the sixth state in the country and the first in the southeast to follow the federal model and establish an initiative to increase shellfish. State shellfish initiatives provide a vehicle to leverage existing partnerships, grant programs and regulatory authorities to maximize the benefits of shellfish. Establishing innovative partnerships among state agencies, local governments, the federal government, the shellfish industry and nonprofit organizations is an effective and efficient way to maintain both vibrant coastal communities and healthy coastal ecosystems. The Aug. 2 announcement is open to the public and will begin with brief remarks from Sec. 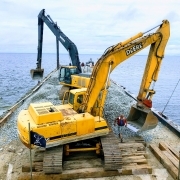 Regan as well as representatives from other federal, state and private stakeholders involved in shellfish restoration, production and research and development. Following these remarks, reporters and the public are invited to participate in a short walking tour around CMAST’s campus to learn more about North Carolina shellfish activities and programs from industry, agency, university, and nonprofit partners. The tour will include a visit to the North Carolina Sea Grant Shellfish Farming Demonstration Center, a regional technology center and proving ground for training prospective growers such as commercial fishermen wishing to enter the mariculture industry. By leveraging partnerships and sharing knowledge and resources through the North Carolina Shellfish Initiative, partners will be able to preserve the state’s rich shellfish history while also fostering a sustainable future. For more information, contact Erin Fleckenstein with the North Carolina Coastal Federation at erinf@nccoast.org.